The 2 Port video splitters are designed to boost the duplicate the video signal from any analogue source device two displays.To achieve multiple high quality VGA,SVGA,or Multisync video signals over long distance,the video splitter is your best choice. 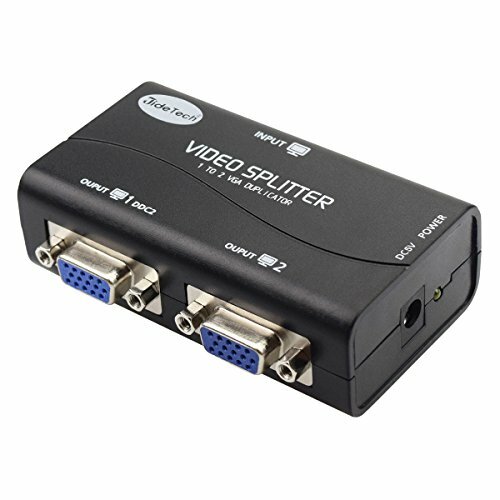 Product type: 2 Port VGA Splitter. Interface Type: 1 VGA INPUT, 2 VGA OUTPUT. 1.If you connect a DDC type monitor to video port 1,all other monitors must be able to support the highest resolution that DDC monitor can provide. 2.These products are designed for VGA,SVGA,and Multisync monitors .They are not suitable for CGA,EGA,or MONO type monitors that use digital video signals. 1 VGA IN, 2 VGA OUT. Support ultra high 250 Mhz video bandwith. Superior video quality - 1920x1400@60Hz. DDC, DDC2, DDC2B Compatible. Units can be daisy-chained to handle as many monitors as the installation requires,making an excellent solution for public broadcast system. Ideal for public broadcasting;remote monitoring,classroom and training facilities. If you have any questions about this product by JideTech, contact us by completing and submitting the form below. If you are looking for a specif part number, please include it with your message.